How to Boost Interactivity in a Webinar? Why would one prefer a live webinar instead of a recording? The key to this question is interactivity. But how to achieve this? Which activities increase participation and interactivity? Try to keep participants active and involved at all times as there are so many possibilities for distraction online (checking emails, instant messaging…). Before and during the webinar use the poll pod/feature. Ask what they want to learn during the webinar. Or even ask how they are feeling today through a poll. Reply to questions or comments as soon as possible to show appreciation. Ask questions frequently to be answered through the chat. The whiteboard of Adobe Connect has been technically enhanced recently. Use it for brainstorming. Try to experiment with external tools for live collaboration like Padlet or Google Docs/Drive. The advantage is that the results are available even after the webinar and can be further elaborated. Try to avoid moderating an online meeting alone. Include a second person to be in dialogue and exchange with you. To hear two voices is much more pleasant especially if you have mixed sexes. 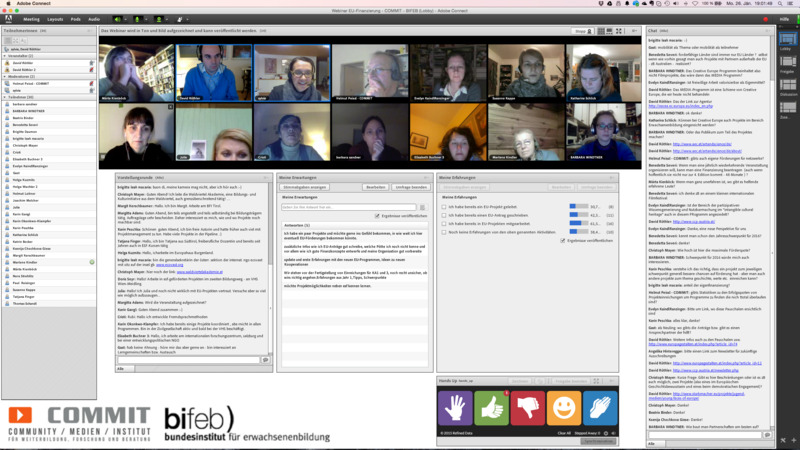 This screenshot shows a webinar using the mentioned HandsUp pod. What would you recommend? Please, feel free to share your experience and comment this post.